Evan Lewis’s stories featuring the ghost of Davy Crockett and his descendant David Crockett are distinguished by the lively verbal jousting of the principals, though when the two can simmer down, they make a great pair of sleuths, as demonstrated in “Mr. Crockett and the Longrifle” in our May issue. Here, however, we’re delighted to offer Mr. Lewis’s reflections on a very different kind of mystery writing. Pulp fiction came into my life when I was eleven years old, and I was never the same again. It happened at the neighborhood Rexall Drug store, and came in a series of paperbacks starring Doc Savage, The Man of Bronze. The writing spoke to me. It was direct, conversational, and loaded with personality and humor. The author was not only having fun, he was being paid to be a smart-aleck. I wanted to be a professional smart-aleck too. 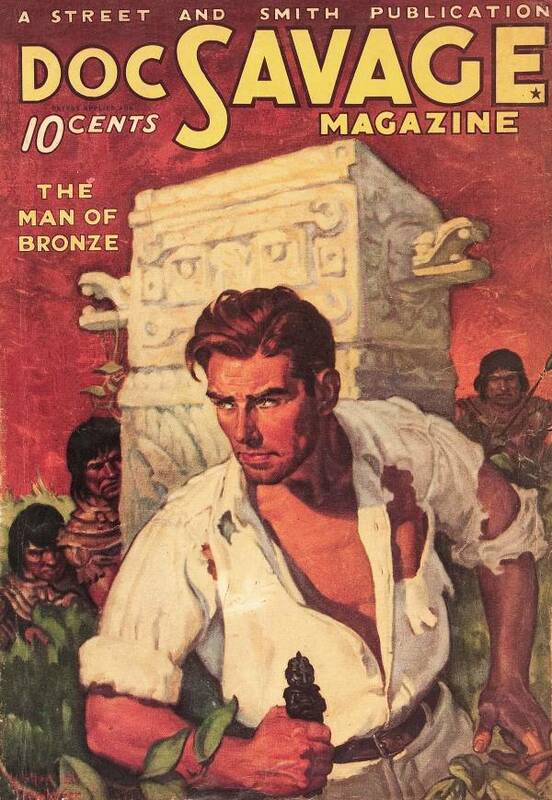 Years later I learned that Doc Savage was a pulp hero, that most of his adventures were written by Lester Dent, and that the style I so admired was considered hardboiled. 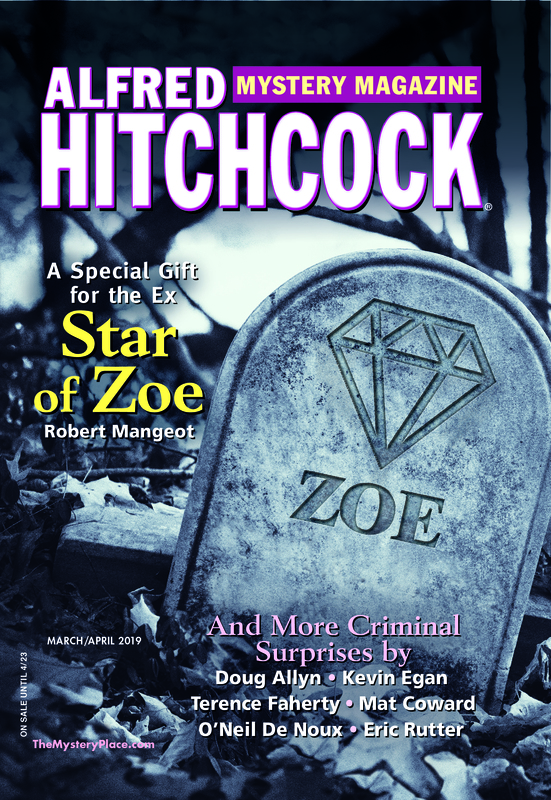 My search for more such stuff led to Dashiell Hammett, Raymond Chandler and their less-famous contemporaries. At the time, very little of that stuff was in print, so I went to the source, hunting down the pulps themselves. The more I read, the more I realized that my favorites were the guys having the most fun. They were the smartest of the smart-alecks, experimenting with the language and injecting plenty of personality and humor into their writing. I found their style infectious, and if my own stories are a little wacked-out, it’s mostly their fault. 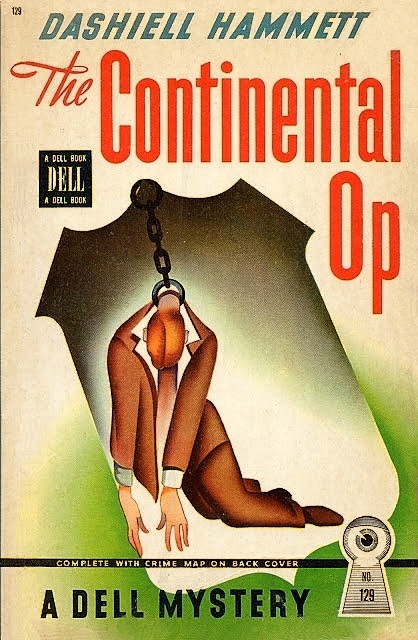 DASHIELL HAMMETT is revered by fans and critics for The Maltese Falcon, and I think it’s a fine novel, but the stories that really grab me feature The Continental Op. The Op began as a nearly invisible narrator and evolved into a supreme smart-aleck, reaching his peak in the novel Red Harvest (originally published as four novelettes in Black Mask). RICHARD SALE was another guy whose best work was in the pulps. 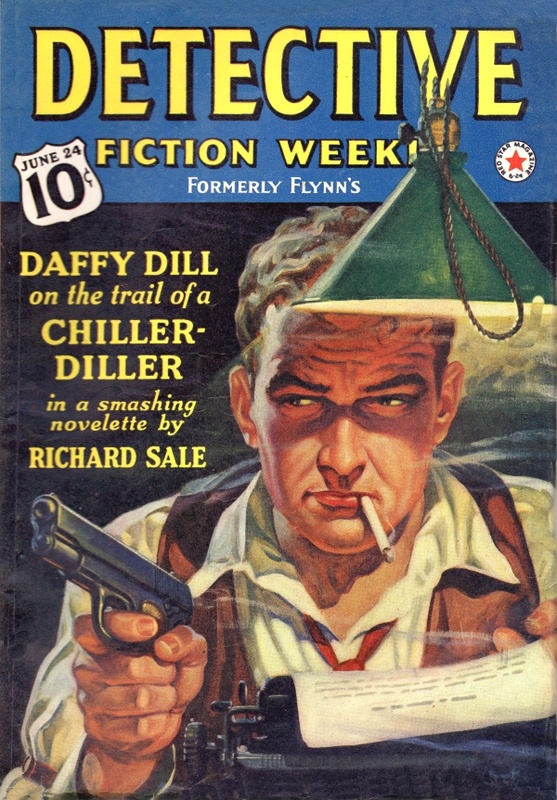 Sale’s most popular character was Daffy Dill, a smart-mouthed but literary-minded reporter who appeared in more than sixty novelettes. You’ll find one apiece in the anthologies The Hardboiled Dicks, Hardboiled Dames and The Black Lizard Big Book of Pulps. As a public service, I’ve posted five more Daffy adventures on my blog. NORBERT DAVIS had a tremendous talent for humor, but rarely turned it loose in the pulps. You’ll find it, though, in the three novels and two novelettes featuring Doan and Carstairs. Doan is a harmless-looking but deadly dangerous detective, and Carstairs is his high-minded Great Dane. The absolute best of the series is the novel Sally’s in the Alley, which is exceedingly easy to come by. CLEVE F. ADAMS is the forgotten man of hardboiled fiction. He wrote well over a hundred pulp stories (some sources say more than three hundred) and authored more than a dozen novels. The typical Adams hero thinks he’s a heel and strives to act like one, but down deep he’s a good and honorable guy. This inner struggle produces a humor that’s unique in detective fiction. And for even more comic relief, he usually has a dimwitted sidekick. All of Adams’ books are worth seeking out, but I particularly recommend Sabotage and The Private Eye. 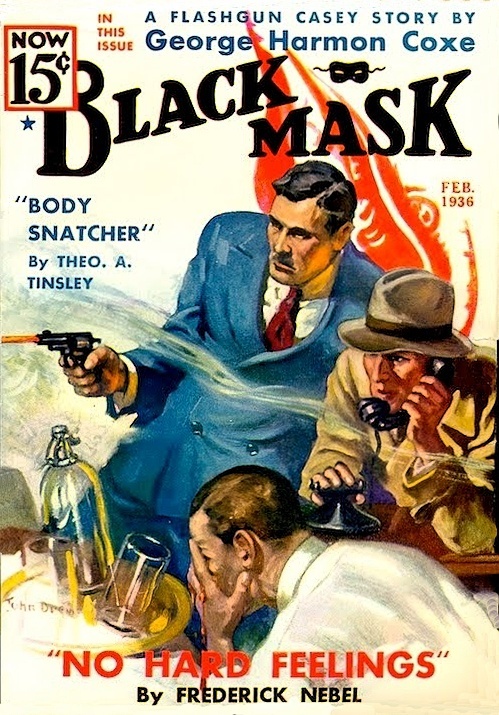 JONATHAN LATIMER did not write for the pulps, but his five novels starring hard-drinking detective Bill Crane followed the Black Mask tradition. All five are wonderfully wacky, but my favorite is The Lady in the Morgue. That book gives Crane not one but two smart-mouthed sidekicks, and their book-long bender results in some hilarious three-way repartee. I like to think there’s a little Continental Op and a little Daffy Dill in my narration. A little MacBride & Kennedy and a little Doan & Carstairs in my relationships. A little Adams and little Latimer nibbling at my sanity. And always, a lot of Lester Dent in my attitude. With all that pulp fiction bouncing around in my skull, it’s not surprising my two lead characters, Tennessee State Representative David Crockett in AHMM and Skyler Hobbs in EQMM, are both borderline crazy. One believes his inner voice belongs to a dead ancestor, and the other thinks he’s the reincarnation of Sherlock Holmes. Both allow me to embrace my pulp dreams, to laugh at life, and to unleash my inner smart-aleck. Hurray for the smart aleck protagonist! I’m still trying to figure out how you might classify your Davy stories. Hard-boiled paranormal comedic westerns? Whatever they are, they’re great reads. And double-hurray for the shout out for Jonathan Latimer.